Upcoming rivals may soon change this. 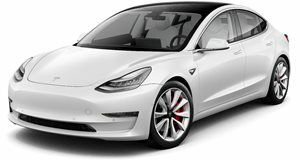 People who think the Tesla Model 3 is overhyped are hard to convince otherwise. But the sales figures don't lie. In fact, recent numbers continue to indicate this all-electric sport sedan is the industry disruptor Tesla CEO Elon Musk always hoped it would be. According to Automotive News Europe and JATO Dynamics, the Model 3 was Europe’s best-selling premium mid-size sedan this past February, its first full month of sales. Sound impressive? It is. What’s more, the Model 3 outsold the Mercedes-Benz C-Class, Audi A4, and BMW 3 Series. A total of 3,630 Model 3s were sold, compared to 3,420 for the C-Class, 1,710 A4s, and 1,700 3 Series. It must be noted these figures take into account only the sedan body style of those German models, not the coupes, convertibles, or wagons. Not surprisingly, the Model 3 also outsold the Alfa Romeo Giulia, Jaguar XE, and Lexus IS, all three of which are available only as sedans. The Model 3 was also Europe’s best-selling all-electric vehicle in February, beating the Renault Zoe (2,884 examples) and the Nissan Leaf (2,333). Tesla outselling premium German and other European brands is nothing new. Last year, Model S sales surpassed those of the Mercedes-Benz S-Class, BMW 7 Series, and Porsche Panamera. But don’t think for a split second these long-established European automakers haven’t taken notice – and action. Porsche is set to unveil its first all-electric model, the Taycan, this September at Frankfurt. Audi will soon follow with the e-tron GT, and Mercedes will continue expanding its EQ-branded vehicles beyond the EQC EV crossover. BMW will not only launch an all-electric variant of its X3 SUV, but also the i4 sedan, which will compete head-on with the Model 3. Tesla, however, appears to be fully prepared to handle this onslaught of competitors. Its recently revealed Model Y crossover will go on sale in Europe in 2021 and a less expensive Model 3 is also due to arrive in the near future. Meanwhile, Model S and Model X sales continue to be strong in Europe and the US, and as long as Audi, BMW, and Mercedes don’t have something to offer Tesla customers, they’ll continue to lose sales to the California-based carmaker. Time is money, after all.